Whiskers is a sweet, friendly lady that belies her years. 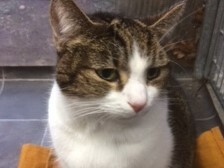 She was signed over with Tibby after their owner sadly passed away. Whilst the 2 have been together a long time, they are equally happy on their own. Whiskers is having a full dental for a sparkly smile and would benefit from a renal diet going forward. At her age, she would suit a calm household but could be happy around older children who are experienced with cats.